Hey ya'lls, how's it goin? 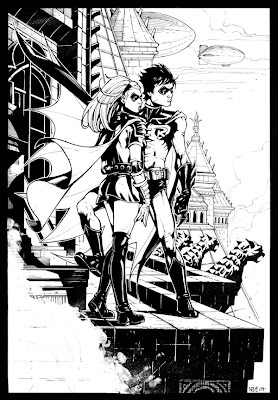 Here's a commission of Robin and Spoiler (in the Robin outfit) I recently finished, thanks again to Stephen for his patience! Robin is one of my favorite characters, so I was thrilled to do this piece. I originally had the two jumping from a rooftop but decided to change it to a more subtle shot, almost romantic in a way, in memory of Spoiler. Hey all, just wanted to share some sketches from the weekend...Saturday was sketching fun at JJ's and Sunday was when I had a sci-fi kick going. Dave Johnson got the ball rolling on this deck to help support a local charity and now, you can win the final piece for yourself! 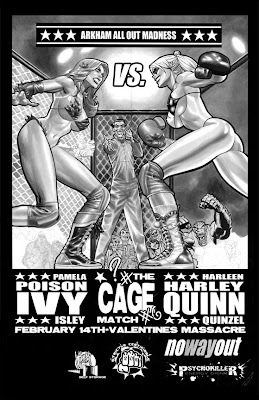 This deck features illustrations by Jim Lee, Dave Johnson, Tommy Lee Edwards, Frank Cho, Mike Mignola and Bruce Timm. All proceeds benefit the Burbank Arts Education Foundation, which "is the only organization dedicated to ensuring permanent and equal access to a quality arts education for Burbank’s 15,000 students." You can also show your support by donating directly to the charity itself. I was a big fan of Gendy Tartakovsky's Clone Wars series that first aired a few years back. More so than the actual Star Wars prequels, I felt like that animated series painted a really cool portrait of just what an entire galaxy at war would look like. 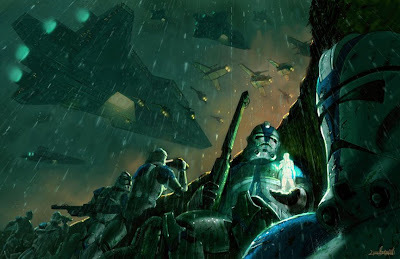 And I always enjoyed seeing these elite Clonetrooper soldiers carrying out an impossible assignment on some god-awful planet. So with this painting, I wanted it to seem sort of like a World War 2 photo taken during one of the rare "quiet" moments of combat. This was also the first digital painting I've done entirely in Photoshop, with no Painter IX. Which I didn't even notice until I finished it. Something that started out as a sketch in my fancy little book grew some roots! well, they are to me. Hey everyone, I thought I would do something a little different this time. 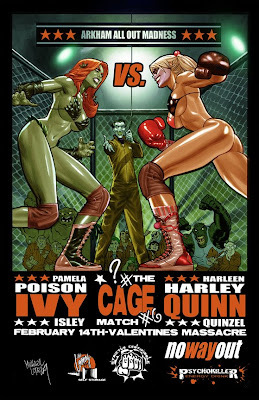 I enjoy a good boxing match, but to make it more interesting, let's add some DC Characters. Batfamily villians up first! So here it is along with a colorized version. 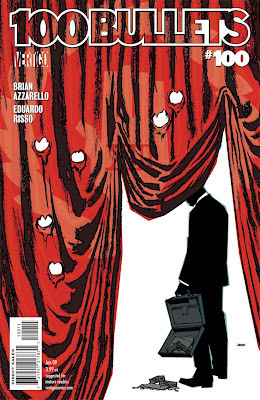 As the curtain draws to a close today, I just wanted to congratulate the whole "100 Bullets" team for a great run! We're all huge fans of the series here in the studio and I can't wait to pick up a copy tonight to see what happens! Started this piece in my hotel room in Cairns, Australia back in November of 2008....that's how long I carry art around with me. This piece, done for fun, has literally travelled the world heh. 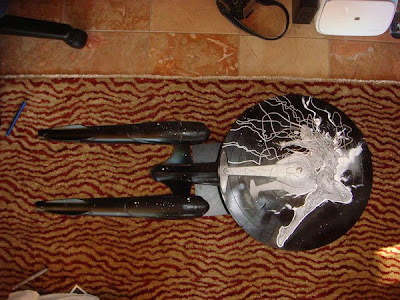 Anyway, I really should have scanned it earlier as it is about 67% done at this point. 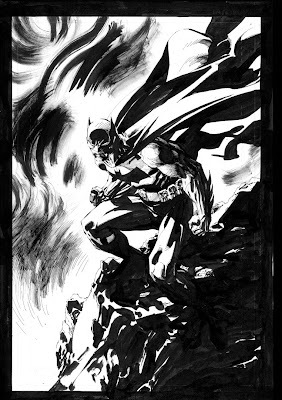 The plan is to do a lot of fine line work (see lower left area of the piece) to create a textured inferno to offset the more "gooey" oil-like rocks Batman is perched on. The idea was essentially Batman overlooking hell. So mostly the fire needs work...a bit more in the rocks and then some whiteout corrections/cleanups and effects. Just trying something different than the traditional rain/moon/cathedral background. Will post further WIPS every day as I basically warm up, noodling parts of this piece here and there. But I make sure to have my composition, my negative space and my shapes and shadows set before I jump in too deeply in the details. 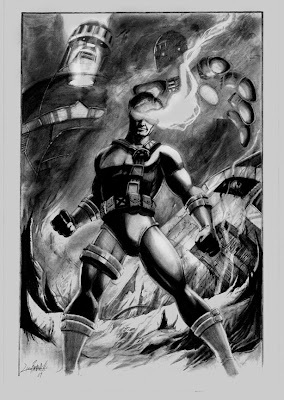 This was a recent pencil drawing commission. 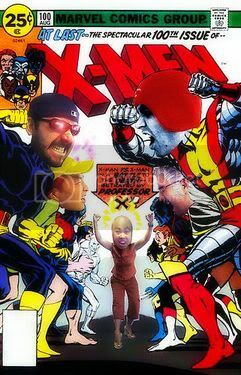 Always fun to wreck some sentinels! Another recent commission, where I was asked to do an unusual pairing of Optimus Prime and the DC Comics character Death. It began as a pencil drawing, but I was asked to do a full color painted version as well so here it is! 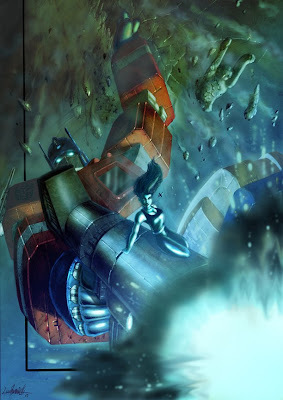 Initially I had Prime's gun blasting out a traditional orange colored blast but it didn't seem to work with Death's icy nature, so I changed it to blue and I think it suits her far better. 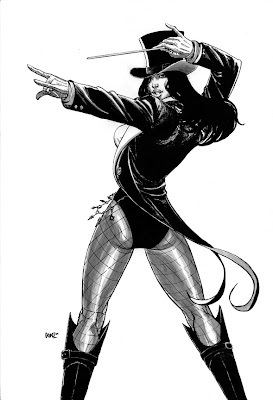 Hey all, just wanted to post a commission I recently wrapped up of Zatanna... 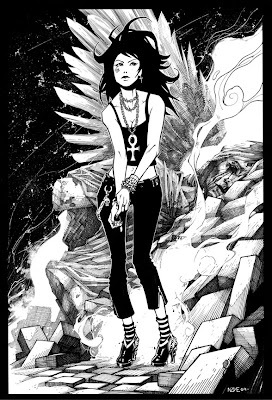 I plan to make a print of this piece for San Diego Comic-Con, but I need to add an overlay for magic and effects in coloring...will post the completed image when ready. This was a commission I did last year but am just now getting around to posting it. Thought I'd color it up and add some type. Really dig the first movie in the series, and personally I still think it holds up today. Cool movie, not sure about the others. When I walked into to the studio the day before yesterday my friend, and Wildstorm colorist Gabe Eltaeb came up to me looking excited and said "did you here the news?" Ironically even though Gabe looked happy...my mind immediately went to something bad....I was thinking..."I got fired, they are moving my desk into the broom closet?" I didn't know what was coming next. He goes "you got nominated for 3 Eisner awards." The reality is we actually got nominated for 4 all total. 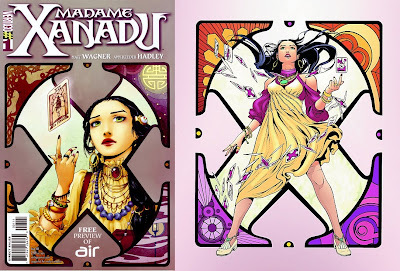 Best New Series, Best Penciler Inker team (Amy Reeder Hadley is the penciler for people who don't know). We also got nominated for Best Cover Artist(s) (I do ink the covers)...but that's is more a "solo" award I believe....and then Matt Wagner got nominated for Best Writer. Pretty amazing stuff. I am very proud of the team and what we accomplished with the strong support of the Vertigo office. I said this before, but many times unless you are a message board maniac (which I am not, I don't go to any comic related websites) once you start working on a book, you have literally NO clue what's going on. I didn't think anyone was really seeing our book in all honestly after the first couple of issues came out. I was proud of the work we were doing and that we were able to get it out consistently on a month to month basis. But man this was a big shock. A very good shock though. I guess all the silence was people reading it. 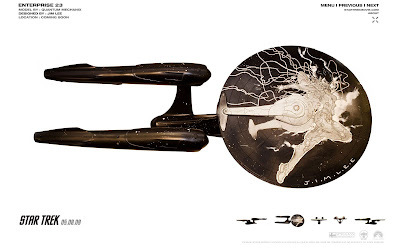 Done for the Starship Enterprise Project...an art exhibit by Paramount Pictures in advance of the new motion picture. 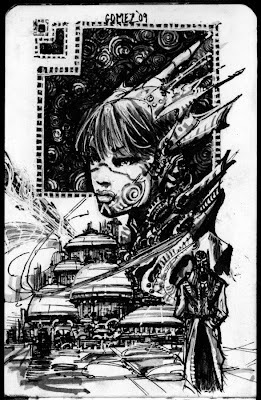 Tubes and cables done with Pentel whiteout sticks and silver metallic Sharpies. Stars done with a splatter off a playing card. 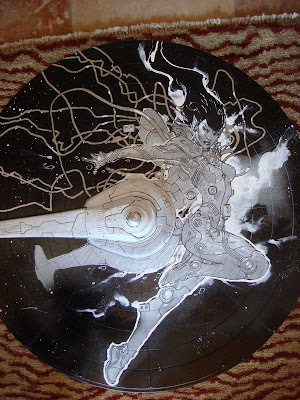 The stars get darker going from right to left to keep the focus on the main figure and saucer element. Closeup of final sans signature. 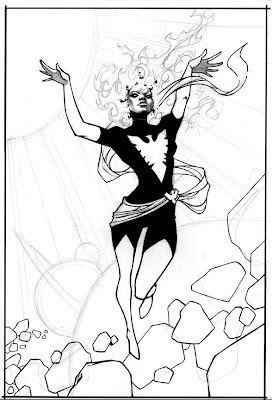 I actually started this Dark Phoenix piece last fall, forgot about it and just found it under a pile of 'To Do', which is a pretty big pile. 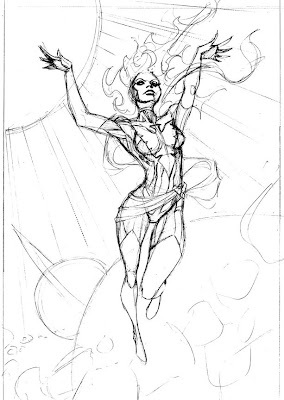 I've done some Phoenix sketches and commissions but this is my first 'real' take on the character. 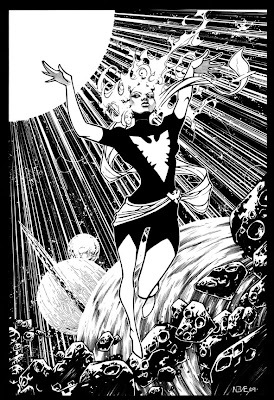 Who doesn't love the 'Dark Phoenix Saga' with all it's grandeur, emotion, and heartbreak? 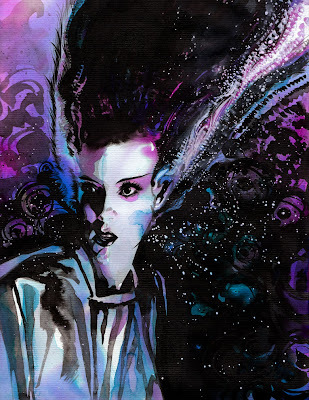 I wanted to convey power, strength, and a cosmic connection all the while giving her a softness, almost angelic and ballerina like. 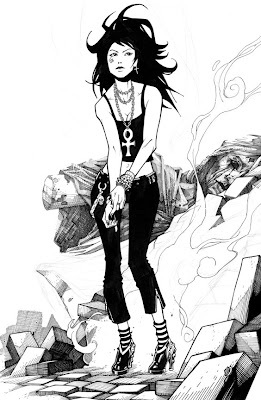 I love the hard/dark and the tender/light contrast that she represents as a character. 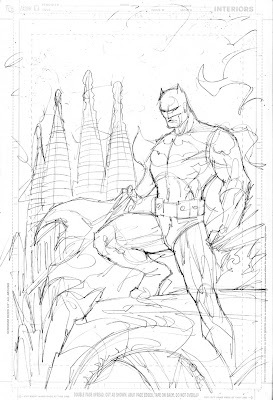 I wanted to pose Batman more upright, almost in parallel to the spires of the magnificent Sagrada Familia and took an artistic liberty of posing him on an arch "erected" entirely so he would be on the same height as the cathedral. 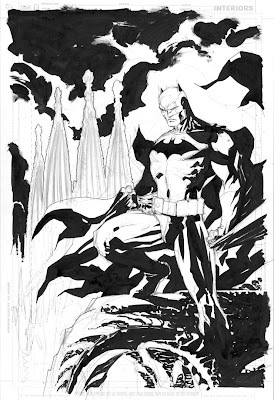 I made the cape more cloak like, made of heavy material, billowing in the wind and spotted the blacks in horizontal swatches of triangular shapes to contrast with the more up and down vertical lines of the spires and the torso and legs. Batman can not be bigger nor more imposing than the cathedral but reflective of its power and majesty. Here I add the detail which adds complexity, nuance, and texture but not at the expense of the composition and the balance of the piece which was already established in stage two. I kept it loose for the background to create a shorter depth of field and to pop the more detailed, gritty foreground off the simpler, more chiaroscuro background. 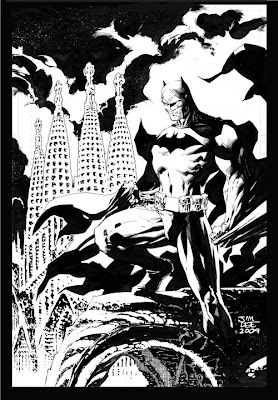 Black and White cover I did for Batman in Barcelona: Dragon's Knight written by Mark Waid. That's the surrealistic gothic spires of the incredible Sagrada Familia in background. Saw em back in '94 or '95...can't wait to see them again at the end of May. 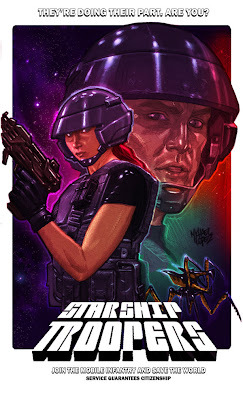 The colored piece by the insanely talented Alex Sinclair. 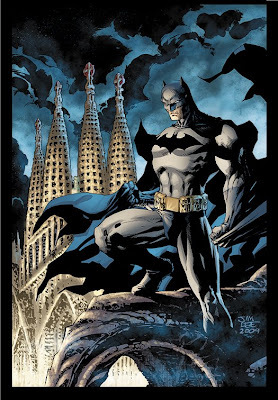 Batman in Barcelona: Dragon's Knight written by Mark Waid. There are articles about the piece online but they are all in Spanish at this point and about 3 pages back in google searches. Hello everyone, every so often here at the studio we have conversations about all the old school cartoons we all grew up with. Cartoons from Silverhawks to Tigersharks and how bada$$ the opening credits and the first episodes were. 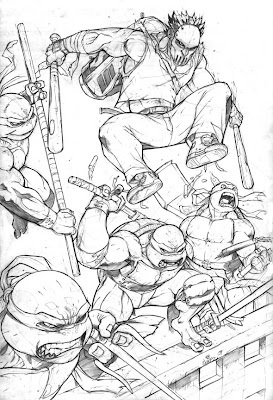 I have always been a turtles fan so I decided to do a piece on our green friends. I have been trying to keep my shapes and silhouettes a lot simpler so this piece was interesting and fun to do. I did this drawing for my good friend, fellow colleague and deviantART member, Oliver Nome. 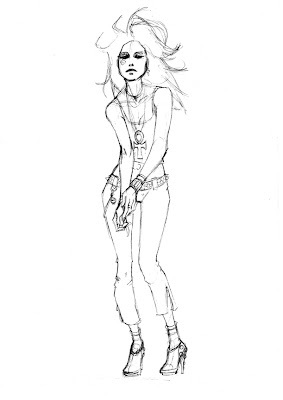 If you know Oliver he is very design and fashion conscience, so I thought I would keep this rendition of Emma Frost very stylish. Hey ya'lls, here is another 'Death' piece that I just finished for fun. It's a little more traditional of an interpretation as compared to the last one that I did. I've been just working on the piece here and there for the last couple of months and just finished. I decided not to render her flesh in grey tones as I usually do with the characters in my pieces because I really wanted her to 'pop' from the statue behind her, which I did in all 'hatching' to achieve the grey tones. I've already got another 'Death' in the works and will post as soon as I'm done. Enjoy!